All this timeAll this time you were just using mainstream exploits which were famous but old. They worked well, but only with old unpatched operating systems, not the updated ones. Now it’s time to move on to the next step. Our poor experience against Windows 8 and Java 7u60 left us shattered, and we realized that fully patched and updated machines with strong antivirus and firewall can be pretty hard to break into. Now we will move into the world of real pentesting, and the first step would be introduction to exploit-db. As usual, a few official words from the developers before I express my personal views. The Exploit Database is a CVE-Compatible Database and (where applicable) CVE numbers are assigned to the individual exploit entries in the database. The public database archive does not contain the mapped CVE numbers, but we make them available to our partnering organizations, making links to The Exploit Database entries available within their products. As many exploit developers lament, it is frequently more difficult to locate a vulnerable application than it is to take a public proof of concept and change it into a working exploit. For this reason, The Exploit Database also hosts the vulnerable application versions whenever possible. Now, what exploit db really is, is nothing more than a database where the pentestors who write an exploit for a vulnerability upload the source code of the exploit of other pentestors too see. It is maintained by Offensive Security (the force behind Backtrack, Kali, Metasploit Unleashed). The exploit-db.com site itself is pretty easy to navigate, and you can find all sorts of exploits there. Just finding an exploit, however, is not enough, as you need to add it to Metasploit in order to use it. Now the site suggest that the exploit can be found here. This will update the framework with new modules. The second alternate the to download the exploit from exploit-db, then put it in the ~/.msf4/modules/exploit/<your_folder> directory. Any exploit put here will be detected my Metasploit when it starts. It will show up when you type use /exploit/your_folder/exploit_name. An important point here is while the <your_folder is arbitrary and can be set to any value, it is recommended to use a proper directory structure. For example, this exploit should be placed in~/.msf4/modules/exploit/windows/browser/ directory .Also, it is mandatory to place exploits in a subdirectory of ~/.msf4/modules/exploit/ or you won’t be able to use it. For newbies in Linux, here is a detailed step by step guide. For examples sake, we’ll use the adobe shader exploit from http://www.exploit-db.com/exploits/33333/ Click on the Save icon to download the exploit. Save it on you Kali Desktop. 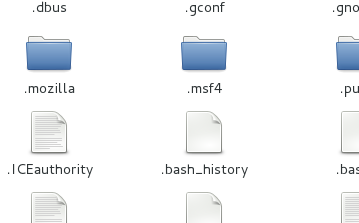 Now if you are not well versed with linux, you will need help with creating the directory and placing files there. Although I’m guiding you how to do it, you should be proficient in linux usage and should be able to do the basic stuff like this atleast. So, you can either use the command to line create the directories or do it using the GUI. Create the DIRECTORY(ies), if they do not already exist. To see what the directory has, execute ls. It will return nothing as the directory is empty. Now we’ll use mkdir to create what we need. Assume you have adobe_flash_pixel_bender_bof.rb file on your desktop. Then use the following commands. Go to computer -> Filesystem->Home. Now you won’t see .msf4 there, because the . prefix is for hidden files. So go to view and select show hidden items. Now it will be visible. Now the rest is going to be a piece of cake. Copy the exploit from desktop, and create the directories by using the easy peasy right click -> New folder method. After that just paste the file where it needs to be. You’ll be done. Now start msfconsole again or type reload_all to reload the module. This will add the module to metasploit and you can use it as you normally would.